Gratitude, according to psychologists, is the healthiest of all human emotions—good for both giver and receiver alike. Gratitude stimulates the hypothalamus (the brain’s stress regulation center) and the ventral tegmental area, which is a key part of our “reward circuitry” that produces the sensation of pleasure. Hans Selye, a renowned scientist who “discovered” stress, believes that gratitude produces more positive emotional energy than does any other temperament. We don’t need science to tell us that focusing on life’s positive aspects makes us happier than does dwelling on the negatives—that’s pure common sense, or so says ancient Greek philosopher Epictetus: “He is a man of sense who does not grieve for what he has not, but rejoices in what he has,” as quoted in a recent NY Times article on the subject. A Thanksgiving Feast to remember, put together by our wonderful TNCS teachers and our faithful TNCS parent volunteers. This month, students at The New Century School have been demonstrating gratitude in all kinds of ways, from giving back to the local community to collaborating on a special feast (and, true to the TNCS spirit, in multiple languages!). Professor Manuel’s K/1st students made cornucopias holding pictures of family members—and worked in plenty of relevant Spanish vocabulary! Finally, Li Laoshi and Yangyang Laoshi filmed Lower Elementary students expressing their gratitude for their family members in Mandarin. It all culminated with the annual Thanksgiving Feast, which K/1st teacher Teresa Jacoby started off with a moving thank-you to the students, fellow teachers, and the TNCS families who together make up our magnificent community. Mrs. Jacoby welcomes the crowd and delivers a heartwarming thank-you on behalf of TNCS teachers. A TNCS student passes around her special fruit tray. Beautiful smiles were in abundance on this day! This time of year brings out the best in us, but we can do ourselves a lot of good by making gratitude a routine all year long. That’s what TNCS students seem to be telling us anyway. And so thank you, as always, for reading! TNCS Visits Schools in China! This month, The New Century School was pleased and honored to be part of the 2015 Chinese Bridge Delegation to China. This annual 9-day educational program aims to help K–12 schools strengthen their Chinese programs and partnerships. School visits, cultural activities, and educational workshops comprise the itinerary for this very special opportunity. Welcome speech by Xu Lin, Director General (Vice Minister), Hanban of China Chief Executive, Confucius Institute Headquarters, P. R. China. The 250-member delegation comprising school representatives from all across the United States arrived in Beijing on November 10th and from there dispersed into smaller groups to visit respective provinces. TNCS had the good fortune to visit Tianjin, a bustling port city of ~15 million residents in northeastern China. Tianjin’s mix of traditional and modern architecture is quite renowned, perhaps only slightly less famous than its cuisine. In Tianjin, guests are traditionally welcomed with all manner of noodle dishes and bade farewell with an equal variety of dumplings. But the most well-known Tianjin delicacy is “da mahua,” or 麻花. The Tianjin Eye on the Hai River has the distinction of being the world’s only ferris wheel to have been built atop a bridge! The Ma Hua Culture Center in Tianjin. Da mahua is a fried dough twist made with ingredients such as flour, sesame, walnut, peanuts, osmanthus, and other variations. Rock sugar provides sweetness. Despite all of the amazing sights Tianjin had to offer such as Wudadao (Five Great Avenues) and the surrounding historic districts, however, the real purpose of the visit was to tour schools. TNCS was very warmly welcomed by Kunming Road Primary School and Weishan Road High School, with whom friendships were made and future partnerships proposed. Students from Kunming Road Primary School pulled out all the stops to welcome the Chinese Bridge Delegation. The paparazzi followed the delegation everywhere :)! These 3rd-graders show their respect for their teacher by turning their palms inward when raising their hands . They also sit on their hands to prevent fidgeting during instruction! After a lovely cultural presentation on traditional Chinese dancing by various ethnic groups, these little ambassadors shared delicious local grapes. A welcome from Weishan Road High School. Weishan Road High School students—more than 1,500 of them—take morning exercises in two shifts. During the school visits, the delegation met with Chinese educators, observed classes, and interacted with students. The graciousness with which Principal Li and Principle Wen welcomed the delegation into their respective schools was wonderful to experience. It was clear that they were striving to impress the delegation in the hopes of establishing meaningful partnerships with U.S. schools. The Tianjin visit culminated with a very special tour of Tianjin International Chinese College, which hosts students from abroad to learn the Mandarin Chinese language and be immersed in several facets of Chinese culture. The president of Tianjin International Chinese College, Zhao Hongtao, is presented with a plaque of appreciation by College Board vice president, Jim Montoya. After a few days, the delegation in its entirety regrouped in Beijing to visit one more primary school, network with U.S. colleagues, attend presentations on best practices, and gather resources to build and support Chinese language and culture programs. TNCS will soon reap the benefits of this incredibly productive visit to China from increased idea exchange and resources as well as personal contacts. Students wave Chinese and American flags to demonstrate our shared interest in improving education. Students from Qi Ying Primary School greet the delegation. Breakout session: Spotlight on Developing Successful Partnerships. Everywhere the delegation went, they received four-star treatment . . . and lots of entertainment in the form of singing, dancing, and more. TNCS students might just recognize this lovely song . . . This week, Immersed is thrilled to bring you a guest blog post on the human microbiome by Dr. Anne M. Estes, a postdoctoral fellow at the Institute for Genome Sciences at the University of Maryland, School of Medicine in Baltimore. When you look in the mirror, what you do not see is extremely important for your health. Meet your microbiome—all the bacteria, fungi, and viruses living in and on you . While scientists are unsure exactly how many microbial cells are present in and on humans, we currently estimate that there are at least three times more and perhaps ten or one hundred times the number of microbial cells than human cells . Hey—wait—back away from the hand sanitizer! The vast majority of these microbes are helpful. We’ve been brought up to think of viruses and bacteria strictly as “germs” that cause disease, but without helpful microbes you wouldn’t be able to properly digest your food  and would lack certain vitamins [4–6]. In fact, it’s the loss of these helpful microbes that corresponds with an increase in several diseases including diabetes, allergies, asthma, obesity, autism, and numerous digestive system disorders such as irritable bowel syndrome, colitis, Crohn disease, and celiac disease. The symptoms with each of these diseases is different. However, the National Institutes of Health–funded Human Microbiome Project (HMP) and other projects have discovered that people with each of these ailments have a microbiome that is strikingly different from that of healthy people [7–11]. This information about the human microbiome is changing the way both basic science and medicine think about human health . Left: Diversity of animals living in different habitats of the Earth. Right: Different bacteria found on individual people. You are a home for trillions of microbial cells [13–16]. A walking, talking, microbial planet. The bacterial component of the microbiome is best understood. Bacteria are so tiny that millions of them can fit on the antennae of an ant. The ratio of the size of the common gut bacterium Escherichia coli (E. coli) compared to your body is similar to the ratio of a human body compared to the Earth. Just like the Earth has different habitats–mountains, lakes, deserts, swamps–so does the human body. In each of the Earth and human habitats, specific organisms flourish in those particular conditions. Different bacteria, fungi, and viruses live in the rainforest-like habitat of your armpit than live in the hot, dry, low nutrient, and high UV intensive desert-like habitat of the back of your hand. The HMP set out to map out some of the bacterial habitats of the human body. To visualize these different communities, the HMP made a neat interactive program called SitePainter that maps where a certain bacterium is found on the body . Try it out and see which bacteria are found in various locations. As you switch between bacterial types, you’ll see how many or few places they can live. You may also notice microhabitats within larger habitats. In the mouth, some bacteria are only found in a portion of the plaque near the tooth surface. Others, only in the dry skin behind the ear. An Image captured from SitePainter demonstrating the different habitats where various bacteria are found. Create your own map at http://www.hmpdacc.org/sp/. Take a minute to imagine how many different bacterial habitats are on and in you. How do you think the temperature, moisture, and nutrients in your bellybutton compare to your nostril? Stomach? Mouth? Front teeth versus molars? Each different mixture of these physical parameters potentially creates a new habitat. Add in the amount of oxygen, pH, and osmolarity of the body habitat as well and you can quickly think about the vast diversity of bacterial habitats your body has, especially for microscopic organisms. I doubt anyone has calculated a specific number of body habitat sites and that number doesn’t really matter. What is important is that when considered from a microscopic organism’s perspective, in and on your body are a vast array of potential places to live. How these microbes get to the particular habitat and survive and how they are restricted from other habitats is under study. What you DO with that body and what you feed your body will also change the habitat for your bacterial residents. Do you bathe daily? Weekly? Do you use antibiotic soaps? Play in the dirt? the ocean? your room? Do you have a dog? Cat? Gerbil? Baby sister? How were you born? What were you fed as an infant? All of these factors can change your resident microbiome. Harsh cleaners and antibiotics can damage your natural microbiome. Where you play and what you play with may introduce new microbes from the environment to your residential microbiome if there are open spaces for the bacteria to live in and the proper conditions for them to survive. You’re colonized with trillions of bacteria. So what? These invisible inhabitants of Planet You are quite important. Sometimes they are breaking down nutrients or toxins, sometimes they make vitamins, other times they simply take up a space and prevent a pathogen from living there. In many cases, scientists are just beginning to understand what’s going on and new features are frequently discovered. In some cases, these bacteria are working together with other bacteria or other microbes to feed off of one another. In the macro-ecosystems of Planet Earth, plants use carbon dioxide that animals exhale and the sun’s energy to make sugars to help themselves grow. Plants “exhale” oxygen as a waste product of this sugar making process (called photosynthesis). Animals can then use the oxygen and plant sugars, as well as animal proteins, to help themselves grow. Plants and animals feed off of and recycle each other’s waste products. Without oxygen from photosynthesis, animals would not live. The ecosystem would collapse. Similarly, microbes use each other’s waste products to grow. One microbe’s waste products are another microbe’s dinner. Particular microbes have distinct sets of genes that allow those microbes to break down specific nutrients from what the host eats. For example, some digestive system bacteria feed on plant fibers. If their human host doesn’t eat any or very little complex plant fibers, the bacteria will not get fed. Some of these bacterial types may turn to feeding on the protective mucus the large intestine produces and creates problems for the host . Others may enter a dormant stage waiting for the food they can eat. Other bacteria synthesize vitamins such as the B vitamins and vitamin K. Without those vitamins, the human host can have a range of problems from decreased blood clotting to immune and nervous system problems . From head to toes, inside and out, you are a planet for your resident microbes. Though these microbes are invisible to the naked eye, their importance is becoming increasingly apparent. As Earth has a series of habitats with characteristic organisms, so does the human body. Without the many microbes that call you home, your ecosystem can malfunction. Diet is one of the key ways to take care of your microbiome. A future post here will discuss what is currently known about the influence of diet on the gut microbiome. For more information on the interaction between microbes and human health, see my blog Mostly Microbes. It is my hope that my blog will serve to connect you to this invisible and essential part of yourself. Lederberg, J., and A. McCray. 2001. Ome sweet ‘omics:—A genealogical treasury of words, p. 8. The Scientist, vol. 15. The Human Microbiome Project Consortium. 2012. Structure, function and diversity of the healthy human microbiome. Nature 486:207–214. Cantarel, B. L., V. Lombard, and B. Henrissat. 2012. Complex carbohydrate utilization by the healthy human microbiome. PLoS ONE 7:e28742. LeBlanc, J. G., C. Milani, G. S. de Giori, F. Sesma, D. van Sinderen, and M. Ventura. 2013. Bacteria as vitamin suppliers to their host: a gut microbiota perspective. Current Opinion in Biotechnology 24:160–168. Hausmann, K. 1955. The significance of intestinal bacteria for vitamin B12 and folic acid supply in humans and animals. Klin Wochenschr 33:354–9. Albert, M. J., V. I. Mathan, and S. J. Baker. 1980. Vitamin B12 synthesis by human small intestinal bacteria. Nature 283:781-2. Cho, I., and M. J. Blaser. 2012. The human microbiome: at the interface of health and disease. Nat Rev Genet 13:260-270. Hofer, U. 2014. Microbiome: Bacterial imbalance in Crohn’s disease. Nat Rev Micro 12:312–313. Turnbaugh, P., M. Hamady, T. Yatsunenko, B. Cantarel, A. Duncan, R. Ley, M. Sogin, W. Jones, B. Roe, J. Affourtit, et al. 2009. A core gut microbiome in obese and lean twins. Nature 457:480–484. Ley, R., P. Turnbaugh, S. Klein, and J. Gordon. 2006. Microbial ecology: human gut microbes associated with obesity. Nature 444:1022–1023. Qin, J., Y. Li, Z. Cai, S. Li, J. Zhu, F. Zhang, S. Liang, W. Zhang, Y. Guan, D. Shen, et al. 2012. A metagenome-wide association study of gut microbiota in type 2 diabetes. Nature 490:55–60. Khanna, S., and P. K. Tosh. 2014. A clinician’s primer on the role of the microbiome in human health and disease. Mayo Clinic Proceedings 89:107–114. Costello, E. K., K. Stagaman, L. Dethlefsen, B. J. M. Bohannan, and D. A. Relman. 2012. The Application of Ecological Theory Toward an Understanding of the Human Microbiome. Science 336:1255–1262. Zhou, Y., H. Gao, K. Mihindukulasuriya, P. La Rosa, K. Wylie, T. Vishnivetskaya, M. Podar, B. Warner, P. Tarr, D. Nelson, et al. 2013. Biogeography of the ecosystems of the healthy human body. Genome Biology 14:R1. Pepper, J. W., and S. Rosenfeld. 2012. The emerging medical ecology of the human gut microbiome. Trends in Ecology & Evolution 27:381–384. Turnbaugh, P., R. Ley, M. Hamady, C. Fraser-Liggett, R. Knight, and J. Gordon. 2007. The human microbiome project. Nature 449:804–810. Gonzalez, A., J. Stombaugh, C. L. Lauber, N. Fierer, and R. Knight. 2012. SitePainter: a tool for exploring biogeographical patterns. Bioinformatics 28:436–8. Johansson, M. E., J. K. Gustafsson, J. Holmen-Larsson, K. S. Jabbar, L. Xia, H. Xu, F. K. Ghishan, F. A. Carvalho, A. T. Gewirtz, H. Sjovall, et al. 2014. Bacteria penetrate the normally impenetrable inner colon mucus layer in both murine colitis models and patients with ulcerative colitis. Gut 63:281–91. Kau, A. L., P. P. Ahern, N. W. Griffin, A. L. Goodman, and J. I. Gordon. 2011. Human nutrition, the gut microbiome, and immune system: envisioning the future. Nature 474:327–336. Dr. Anne M. Estes currently does research on dung beetle microbiomes as a post-doctoral fellow at the Institute for Genome Sciences at the University of Maryland, School of Medicine in Baltimore. Anne is also known as “mama” by two curious and fun little ladies, ages 2 and 7. Though her blog, Mostly Microbes, Anne explores the interactions between microbes and their human hosts. She focuses on the importance of the human microbiome for and during pregnancy, birth, infancy, and early childhood. Microbiology themed kids and adult books, education tools, games, and resources are also featured on Mostly Microbes. Go Outside and Get Dirty, Kids! The following is transcribed from a recent The Nature of Things broadcast by W. Brooks Paternotte on WYPR. The message—that kids need to play outside and get into some dirt—was so well crafted that it is quoted here for The New Century School community in its entirety. Remember playing outside until mom called you in for dinner? Me too. I would ride my bike in the twilight and listen to cricket and cicada songs. My sister would be searching the nearby woods with a magnifying glass, in hopes of finding fairies. My brother would be painstakingly making mud pies. Today’s kids, though? I don’t think they’ll have those kinds of memories. In the last two decades, childhood has overwhelmingly moved indoors. Children are spending half as much time outdoors as they did 20 years ago. In fact, the average American girl or boy spends an alarmingly low 30 minutes in unstructured outdoor play each day. But, he or she might spend 7 1/2 hours each day in front of an electronic screen. That’s about 53 hours of screen time a week. This shift toward staying inside profoundly impacts the wellness of our nation’s youngsters. Childhood obesity rates have more than doubled over last 20 years. The United States has become the largest consumer of ADHD medications in the world, and pediatric prescriptions for antidepressants have risen exponentially. And yet, in a typical week, only 6% of children ages 9 to 13 play outside on their own. So what’s a parent to do in the face of such startling statistics? As with many problems, the first step is getting help. You’ve heard that it takes a village to raise a child? Well, environmental educators believe it takes a backyard, a playground, or a park. Start getting in touch with nature by spending time outdoors with the children you know. It could be as simple as taking a walk through the neighborhood or lifting up a rock to see what’s underneath. Every moment in a child’s life provides an opportunity for discovery—whether it’s seeing tiny turtles emerging from the sand and making their way to the ocean, or watching a spider weave its delicate web. These are experiences that will inspire them. My favorite suggestion for families is to try to grow something together. It could be flowers or vegetables, or even something imaginary. But get kids’ hands in the soil! When they play in dirt, we’re not only allowing them to explore the wonders around them, we’re also exposing them to healthy bacteria, parasites, and viruses that can create a much stronger immune system. Study show that simply having contact with dirt can significantly improve a child’s mood and reduce their anxiety and stress. In fact, multiple studies have shown that childrens’ stress levels fall dramatically within minutes of seeing green spaces. Even more studies have concluded that outdoor time helps children grow lean and strong, enhances imaginations and attention spans, decreases aggression, and boosts classroom performance. 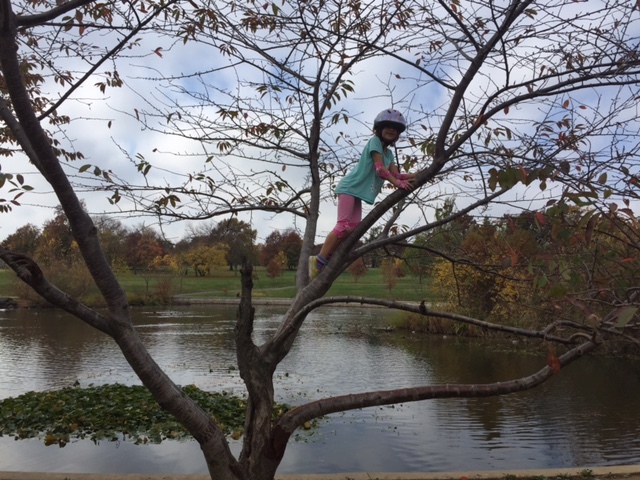 In addition, children who spend time in nature regularly become better stewards of our environment. Maybe try volunteering for organizations that support wildlife or the outdoors. Or get an amazing dose of vitamin D, which can help protect children from future bone problems, by going camping. You don’t have to go far—Irvine Nature Center recently doubled in size and has out-there-feeling camping experiences that can make even the grumpiest of teenagers nicer and more social. Really! Studies have shown that connection to the natural world can make that big of a difference for all of us! As a community, I think we can change the nature of childhood for the better—we can put nature back in it! For more ideas, check out Nature Rocks, a program of the Nature Conservancy. it’s an online resource that makes it easy for families to have fun in nature.